This nice 2 bedrooms, 2 bathrooms, Full basement heated and cooled, mixed use residential, timberland, ranchland Home is sitting on approx 28 acre property with road frontage and holds a pond! Located in Poughkeepsie, AR, Sharp County in the Cave City school district. With 28+/- acres there is plenty of room for the whitetail deer and turkey to call this their home. This home has a large deck off the dining room, and you can see the pond from the deck! There is a fence on 3 sides and they use electric tape for the fence around the house. With large mature timber and great pasture this would make a great Forever Home! Call to view this today! 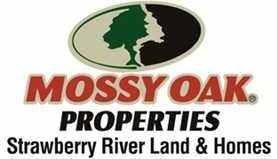 (870)897-0700 Pam Welch with Mossy Oak Properties Strawberry River Land & Homes located in Cave City, AR.